What is the stuff of stars? For astronomers studying "galactic archaeology," Natalie Hinkel has built a giant cosmic museum. Hinkel, a postdoctoral scholar at SF State, has created the largest database of stellar abundances -- the amount and types of atomic elements within a star -- of stars near to Earth. The enormous collection, which Hinkel named the Hypatia Catalog, contains data for more than 3,000 stars within 500 light years of the sun, and will help scholars as well as the public learn more about the properties and history of stars in the Milky Way. Natalie Hinkel, a postdoctoral scholar at SF State, spent nearly two years compiling the massive Hypatia Catalog. "This is a massive, massive resource," Hinkel said. "It gives people, at their fingertips, a lot of data they can use in their research." Stellar abundances form a road map and timeline of the universe, allowing astronomers to learn when stars were born and where they came from. That's because the atomic elements that exist today were not created all at once, but gradually as smaller elements fused together in the infernos of early stars. By examining which elements are within a star and in what amounts, researchers can deduce at what point in space and time it formed, or whether it was altered by an outside force such as a supernova. Variations in stellar abundances may also reveal a star's properties, such as how quickly it rotates or whether it has an exoplanet. "By looking at the elements within a star, you can do a sort of 'galactic archaeology,'" said Hinkel, who is working at SF State with Assistant Professor of Physics and Astronomy Stephen Kane through a grant from the National Science Foundation. "You can get a really good sense of what must have happened in the galaxy for us to be where we are and for nearby stars to be the way that they are." Hinkel spent two years at Arizona State University building the Hypatia Catalog as part of her dissertation. 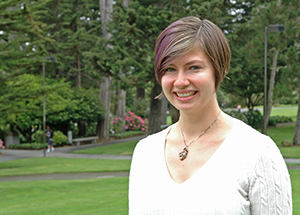 She continued her work after coming to SF State, compiling, organizing and analyzing stellar-abundance data from a variety of outside sources, not all of which matched. "Different groups who measured the same elements didn't get the same results, and not only was that surprising, it was a big challenge," she said. To be as conservative as possible, she included stars for which there was a stellar-abundance discrepancy in her catalog, but did not analyze them in her paper. The analysis Hinkel did conduct resulted in some surprising outcomes. In particular, she found that stars located farther away from the "galactic plane" -- the axis in the center of the Milky Way's spiral "arm," where most of the stars are concentrated -- are made of different amounts of elements than those closer to the plane, refuting the widely held view that the galaxy's stars are all relatively similar in composition. The catalog is named after Hypatia, a 5th-century mathematician and librarian and the first-known female astronomer. "[Hypatia] was an avid philosopher and teacher, and she would have people in her home and give lectures. She was very well-respected," Hinkel remarked. "I'm a female scientist and I definitely want to highlight positive stories about women in science. She's a great model for anyone." The Hypatia Catalog is available to the public at http://iopscience.iop.org/1538-3881/148/3/54/article. Hinkel's research and analysis was published Aug. 18 in Astronomical Journal.